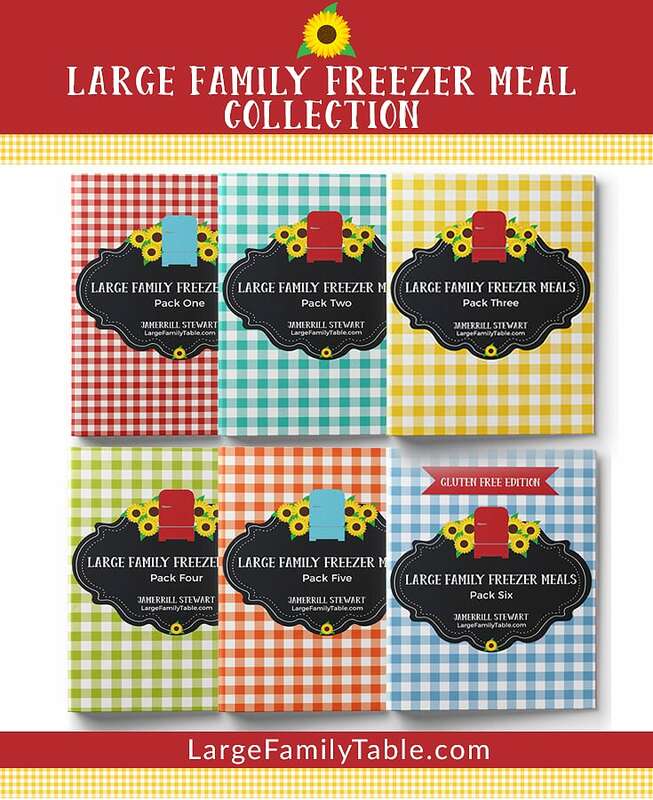 I do a whole lot of freezer meals for my family. 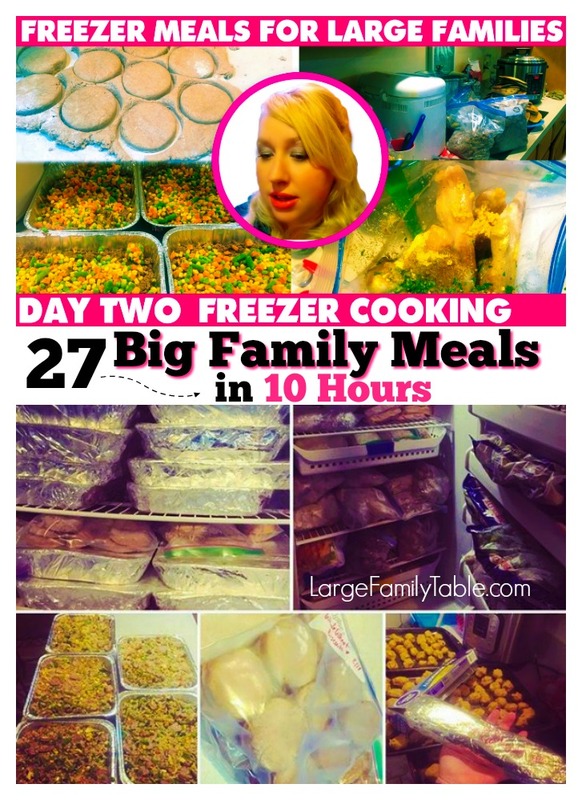 You can see all of my freezer cooking days right here. : ) Anyway, while I do manage to get a ton of meals in my freezer for my family, one extra thing that I do during some of my mega-cooking sessions is to make desserts for the freezer, too. I know it won’t surprise you when I say that we are simple people. We enjoy a fancy meal or dessert at times, but when I am making hundreds of meals in 2 days, I stick to the basics. Like cookies. Got your attention there, didn’t I? Imagine it with me…butter, chocolate chips, peanut butter…all hot and gooey and fresh from the oven. And did I mention that I spend absolutely zero time mixing up cookie dough when we eat these? It takes almost no time to just get cookie dough mixed up and into the freezer. I prefer to do it this way so that we can have cookies at a moment’s notice and I don’t have to wonder if I have all the ingredients when the kids want to bake some. 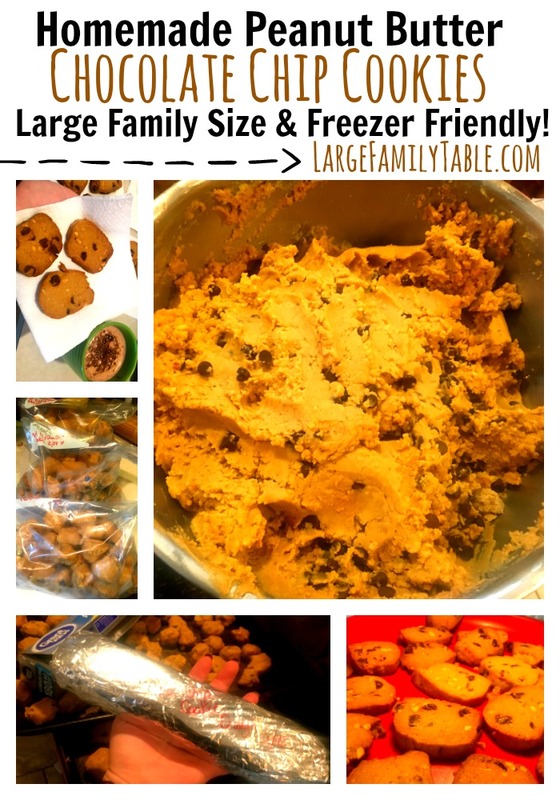 Here is my easy recipe to stock your freezer with ready-to-bake cookies. Ooey, gooey, peanut butter and chocolate chips. Need I say more? Oh yes, cookies. There we go. Mix butter, peanut butter, and sugars until creamy. Mix dry ingredients together and add to butter mixture. Mix thoroughly. Add in chocolate chips and mix until just combined. Form into balls and flash freeze on parchment lined cookie sheets. Store in freezer bags in the quantity you desire. To Bake: When you’d like to have fresh homemade cookies from the freezer, just set your bag of freezer cookies onto the counter for a few minutes. Spray your baking pans with non-stick spray and preheat your oven to 350 degrees. Place the desired amount of cookies on baking sheet and bake up to 14 minutes. I got 12 dozen cookies from this recipe and 2 additional rolls. For the rolls, I simply form cookie dough into a long roll, wrap in plastic wrap, then wrap in foil and label. Then one more wrap in plastic wrap and into a freezer bag they go. To Bake: When you’d like to have fresh homemade cookies from the freezer just set your bag of freezer cookies onto the counter for a few minutes. Spray your baking pans with non-stick spray and preheat your oven to 350 degrees. Place the desired amount of cookies on baking sheet and bake up to 14 minutes. This Homemade Peanut Butter Chocolate Chip Cookie recipe was in my 27+ Large Family Meals in 10 Hours vlog from my day two large family freezer cooking day.